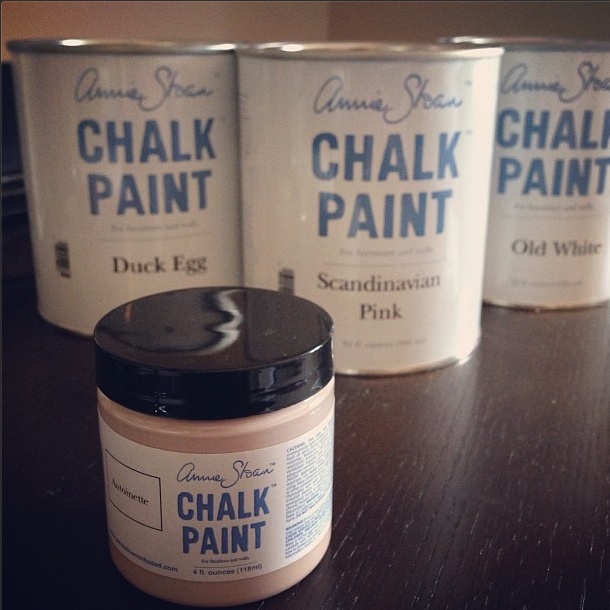 ellehermansen: Annie Sloan Chalk Paint! I will say, I am not a painter - I love to paint my nails and face as I find it therapeutic when I can concentrate on one thing and focus - because focusing isn't second nature to me most of the time. It wasn't easy to make the decision to try and paint because I was afraid of failing! My painting skills are really that bad! Or, I just never applied myself. amazing!) and we brought home "Duck Egg", "Scandinavian Pink", "Old White" a small container of "Antoinette" and couple of her signature brushes and one for waxing along with her clear soft wax. It made it easier on the pocket because my brother and his wife also chipped in some money for my mom for Mother's Day, too! 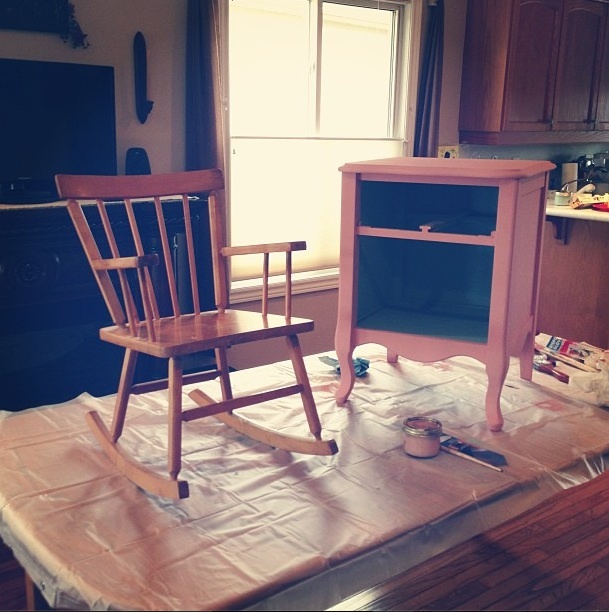 We started on a little stool, and chair and end-table for Edie's room! The end-table started out a lighter Scandinavian pink, but once I brought it into her room it just became too much. Personally, I feel she wouldn't be able to grow with the piece as much as she could with the duck egg blue. A little of this paint goes a LONG way! While you're painting, you'll notice it getting thicker an unless that is what sort of look you're going for - just simply add a few drops of water and mix it up again. You can also water it really down and have it more as a milk paint style. Her paint is just that versatile! The pieces are lighter than the actual colours because we mixed 2 parts Duck Egg Blue to 1 part Old White and the same for Scandinavian Pink - just to make it softer for a little girl's room. Here is her stool and chair. We did the "Louboutin" idea and threw Duck Egg Blue under the chair so when she rocked, it was an extra little surprise :) I didn't capture it, but I am sure there will be more pictures of her on it, soon! 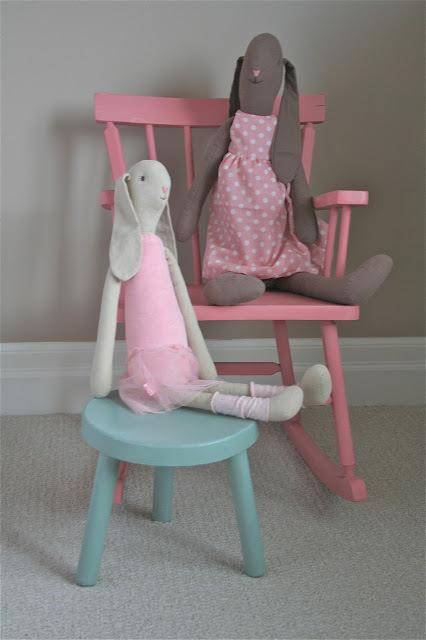 Her little Maileg bunnies enjoy the newly painted pieces, very much! 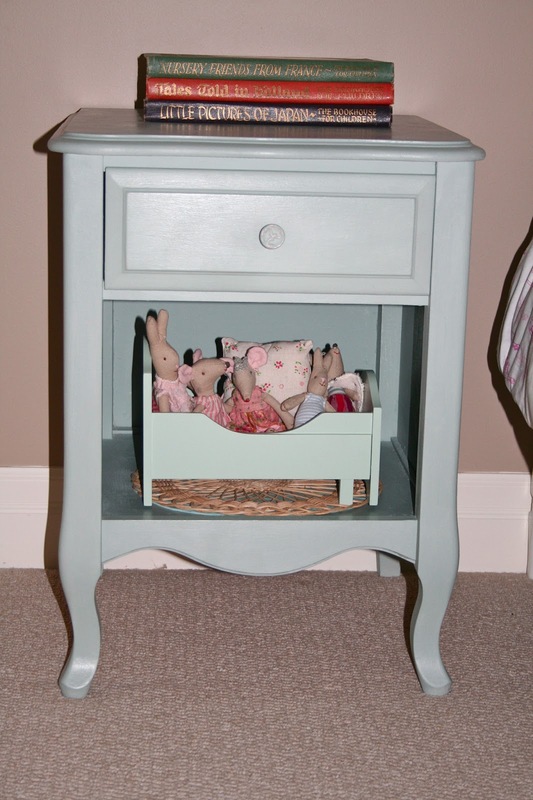 Here is the end table with her other Maileg characters. The bed inside is even called "Duck Egg" and seem to match pretty close but a little lighter and a touch more green. The little girl loves that small cubby for a mini bedroom for her mice and bunnies. Get some Annie Sloan paint! You'll love it and best of all, you'll be able to work with it effortlessly! Also! This is my 600th blog post, on Ellehermansen.com! Woot! *This review is genuine and out-of-pocket paid for. Really you blog have very interesting and very valuable information about the maileg rabbits. You have some honest ideas about the target customer share here I really get many information and discovered most peoples will agree with your blog. Thank you i did really need this topic you share a very nice information about the Record and send video email it's great work. Interesting blog all information are very important for me about the Record and send video email and i really need it thank you. Really very interesting and very valuable information about the snap pack mailers nice work.